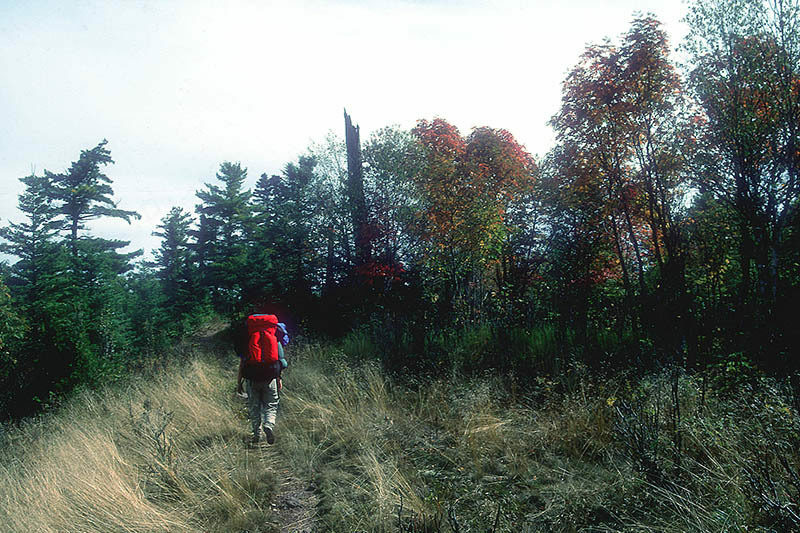 The Feldtmann Ridge Trail is another one of Isle Royales great walks, a 10.3-mile trek across the high ridge from Feldtmann Lake to Siskiwit Bay. Because of a major forest fire in the 1930s, stretches of its crest are open, providing sweeping views of the islands most remote corner. 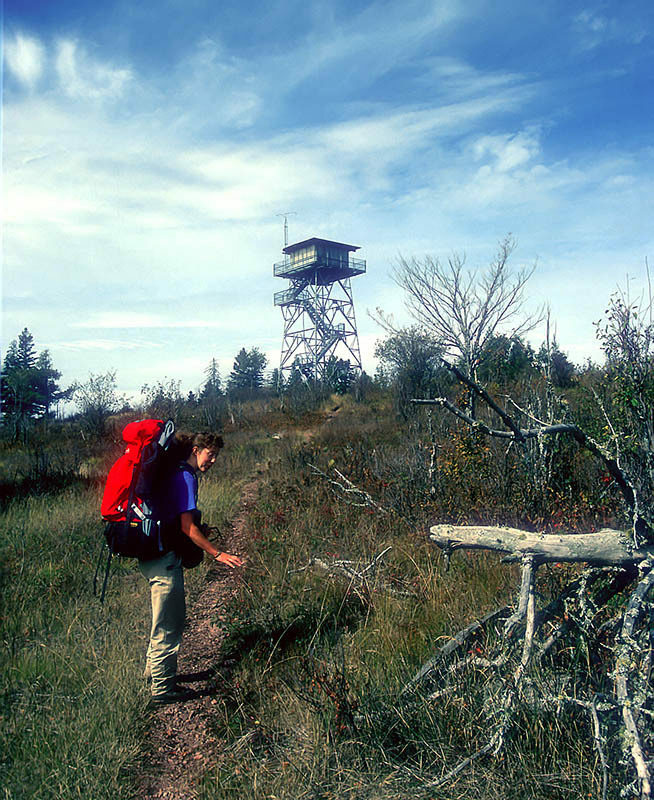 Halfway across it is an old firetower that you can ascend for even better views.When combined with the Feldtmann Lake Trail, a 8.5-mile walk to Feldtmann Lake Campground, the 4.8-mile Island Mine Trail and a portion of the Greenstone Ridge Trail, this trail is the highpoint of a three-day, 30.7-mile circuit that is one of the most scenic in the park. 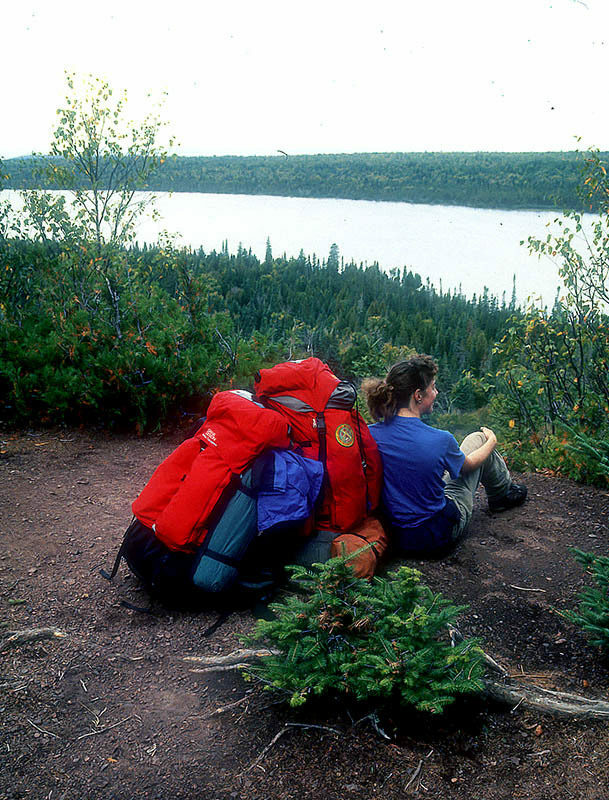 The Feldtmann Ridge Trail is another one of Isle Royale’s great walks, a 10.3-mile trek across the high ridge from Feldtmann Lake to Siskiwit Bay. Because of a major forest fire in the 1930s, stretches of its crest are open, providing sweeping views of the island’s most remote corner. Halfway across it is an old firetower that you can ascend for even better views. When combined with the Feldtmann Lake Trail, a 8.5-mile walk to Feldtmann Lake Campground, the 4.8-mile Island Mine Trail and a portion of the Greenstone Ridge Trail, this trail is the highpoint of a three-day, 30.7-mile circuit that’s one of the most scenic in the park. But best of all, Feldtmann Ridge experiences far fewer hikers than the Greenstone or the trails at the east end of the island. The loop is popular with backpackers from Minnesota who arrive at Windigo as hikers who step ashore in Rock Harbor have to make additional transportation arrangements to reach this trail. But this loop is well worth the additional costs and is the perfect choice for anybody not up for a five to six-day traverse of the island along the Greenstone or Minong ridges. 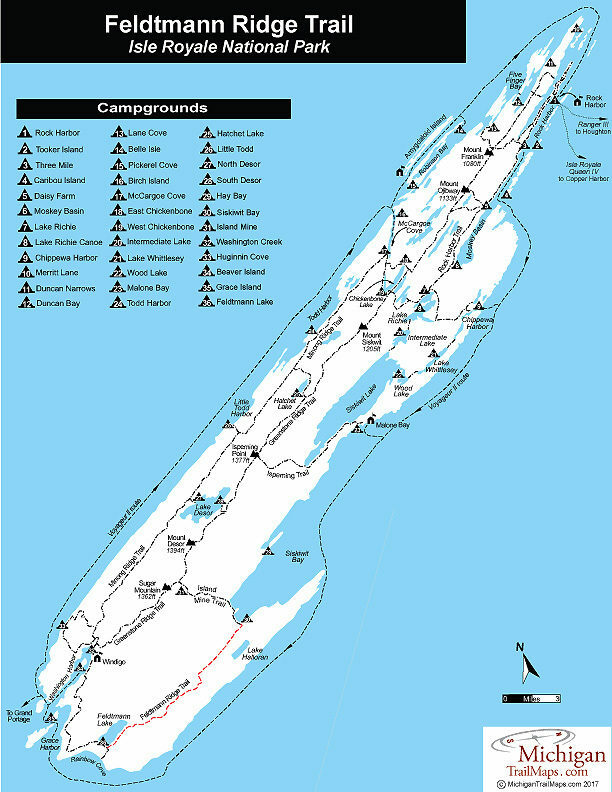 The other alternative is to ferry to Windigo and hike this loop to the Greenstone Ridge Trail near Island Mine Campground. Here you head east, instead of west, to return to Rock Harbor. Such a grand adventure would require seven to eight days but would be unmatched by any other walk on the island in terms of scenery, wilderness solitude and the possibilities of spotting wildlife, particularly moose. Just make sure you pack plenty of gorp. 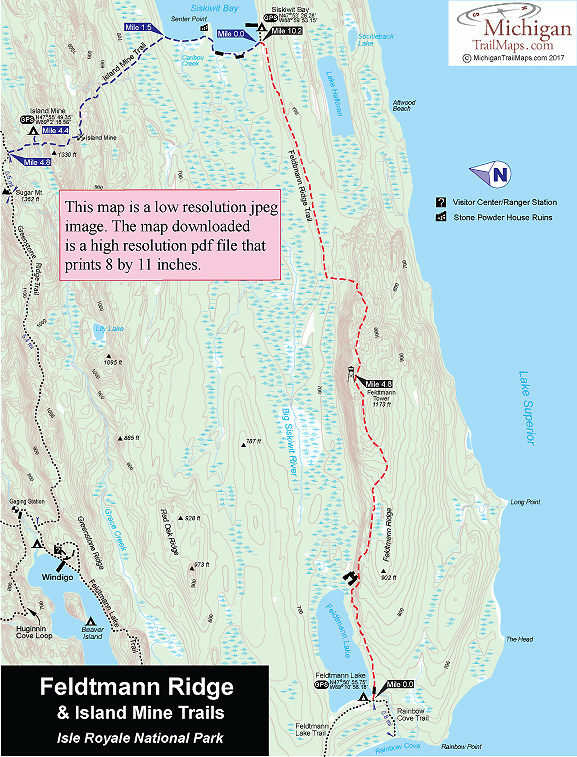 The Feldtmann Ridge & Island Mine Trails is covered with maps in Isle Royale National Park: Foot Trails & Water Routes by Jim DuFresne. To order the 184-page guide to the wilderness island, Click Here. Shower tokens, clean towel, and bar of soap can be purchased at the camp store at Rock Harbor or Windigo. It's also possible to book a cabin at Windigo for lodging. The Windigo Cabins feature table and chairs, a sofa, two bunk beds and electrical outlets but no indoor plumping. For reservations, contact the park concessionaire, Forever Resorts (866-644-2003 or 906-337-4993 in summer; www.isleroyaleresort.com). To reach Windigo and return to Rock Harbor, book passage on the Voyageur II. Alternatively, you can book a flight to Windigo with Royale Air Service, which flies out of the Houghton County Memorial Airport. You can also arrange an inter-island flight between Windigo and Rock Harbor.